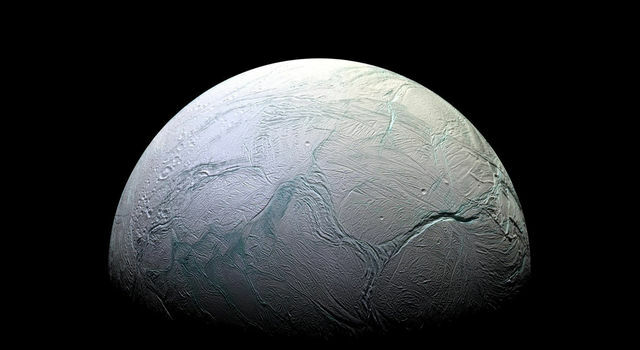 Saturn’s icy moon Enceladus has been making news lately, and it could make even bigger news soon! 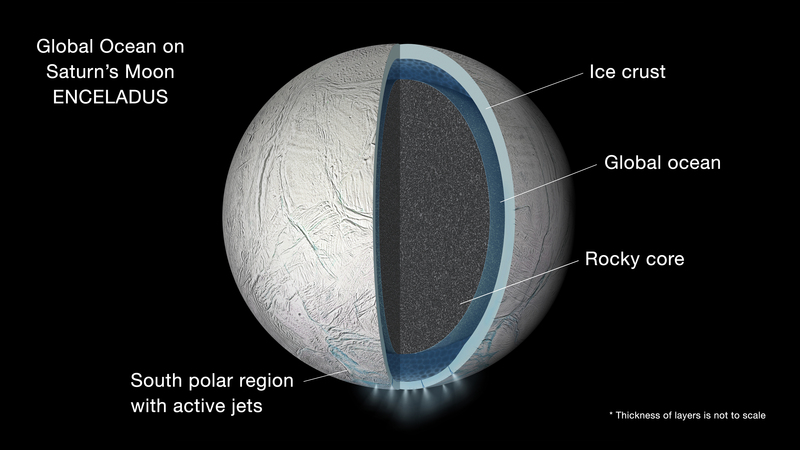 In September, scientists confirmed that there was a global ocean underneath Enceladus’ thick icy shell. That was just the latest in a long history of exciting finds dating back to the beginning of NASA’s Cassini-Huygens Mission to Saturn in 2004 that have helped scientists to better understand this fascinating world! Even while Cassini was still on its way to Saturn, its Cosmic Dust Analyzer detected microscopic grains of silica (tiny grains of sand). On Earth, grains of silica similar in size to those detected near Saturn form when hydrothermal activity -- the processes involving heated water beneath Earth’s surface or ocean -- causes salty water to chemically interact with rocky material to form silica. But where were these grains coming from in the space around Saturn? 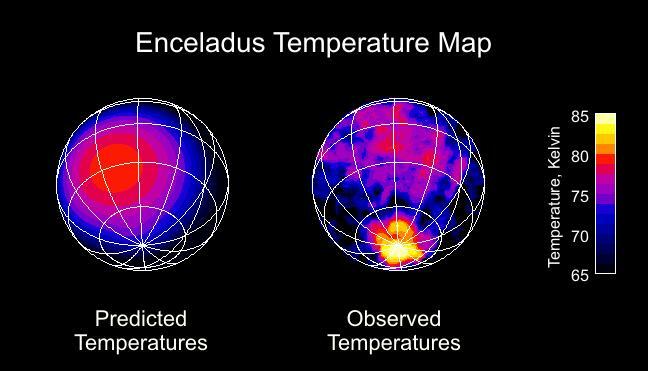 In 2005, scientists were surprised to find out that Enceladus’ south pole is both warmer than expected and warmer than the surrounding areas, suggesting there is a heat source inside Enceladus. Not only that, but they also discovered long parallel cracks in the ice on Enceladus’ south pole. The young age of these cracks, nicknamed Tiger Stripes, meant that Saturn’s icy moon is a geologically active place. Another piece of this puzzle was put in place with the discovery of jets of material spraying out of the Tiger Stripes. Studies have shown these jets are composed of mostly of water vapor, tiny ice particles and small amounts of other material (for example, microscopic silica grains). Together, over 100 jets make up a feature called a plume. Investigating further, scientists have hypothesized that these silica grains are the result of hydrothermal activity on the ocean floor below Enceladus’ icy crust. On October 28, Cassini will fly right through the plume jetting out of Enceladus’ south pole at an altitude of only 49 kilometers (30 miles) – closer than any previous passes directly through the plume! This is an exciting moment in the mission -- one that allows science teams to use a combination of tools on board the spacecraft to strengthen previous findings and potentially make new discoveries. Cassini will use its Cosmic Dust Analyzer to study the solid plume particles and an instrument called the Ion and Neutral Mass Spectrometer to “sniff” the gas vapor in order to determine the composition of the jets. Specifically, the latter instrument is looking for H2, or molecular hydrogen. Finding H2 in the plume will strengthen the evidence that hydrothermal activity is occurring on Enceladus’ ocean floor. And the amount of H2 in the plume, will tell scientists just how much activity is happening. In addition to indicating that hydrothermal activity is taking place, figuring out the amount of hydrothermal activity will give scientists a good indication of how much internal energy there is deep inside Enceladus. That Cassini is making a pass through the plume at such a low, 49-kilometer-high altitude is also important. Organic compounds -- substances formed when carbon bonds with hydrogen, nitrogen, oxygen, phosphorus or sulfur -- tend to be heavy and would fall out of the plume before reaching the heights of Cassini’s previous, higher altitude flybys and be undetected. Organic compounds are the building blocks of life on Earth. Without them, life as we know it wouldn’t exist. If they are present in Enceladus’ oceans, they could be detected when Cassini passes through the plume on this encounter. Perhaps more important, though, are the implications of finding hydrothermal activity somewhere other than Earth. It was once believed that all forms of life needed sunlight as a source of energy, but in 1977, the first hydrothermal vent -- essentially an underwater geyser of hot, mineral-rich water -- was discovered and it was teeming with life. The organisms were using the heat and minerals as a source of energy! Some scientists have hypothesized that hydrothermal vents could be where life on our planet first took hold and could represent environments in the solar system with the necessary ingredients to support life. Here are a handful of lessons and resources you can use to teach key concepts related to the October 28 Enceladus flyby and help your students feel connected to this exciting moment in science at Saturn. NGSS 5-ESS2-1 - Develop a model using an example to describe ways the geosphere, biosphere, hydrosphere, and/or atmosphere interact. Because scientists can’t dig beneath the ice and see what’s below, they rely on creating models that show what is happening beneath the surface. A model helps us imagine what can’t be seen and explains the things that we can see and measure. A model could be a drawing, a diagram or a computer simulation. For this model, students will draw a cut away model of Enceladus and iterate, or improve, their model as you provide more description, just as scientists improved their models as they learned more about Enceladus. Tell students there is a moon around Saturn. They should draw a moon (likely a circle, half-circle, or arc, depending on how big you want the drawing to be). Explain to students that the moon is covered in a shell of ice (students will need to modify their model by drawing a layer of ice). Thus far, everything students are modeling is observable by looking at the moon. Share with students that temperature measurements of the south pole revealed spots that are warmer than the rest of the moon’s surface. Ask students to brainstorm possible sources of heat at the south pole and explain what might happen to ice near a heat source. Based on this new information, and what they think might be causing the heat, allow them to modify their drawing. (Depending on what students brainstorm, their drawing might now include volcanoes, hot spots, magma, hydrothermal vents and a pool of liquid water beneath the ice). The next piece of information the students will need to incorporate into their drawing is that there are large cracks in the ice over the warmer south-pole region. Explain that students have now received images that show jets expelling material from the cracks. They will need to incorporate this new data and add it to their drawing. Tell students that by studying the gravity of the moon, scientists now believe there is an ocean covering the whole surface of the moon beneath the ice. Ask students to share how they would represent that in the model. Allow them to modify their drawing. This model shows what scientists believe the interior of Enceladus may look like. Have students compare it to what they drew and note similarities and differences. CCSS.MATH 6.RP.A.3.B - - Solve unit rate problems including those involving unit pricing and constant speed. For example, if it took 7 hours to mow 4 lawns, then at that rate, how many lawns could be mowed in 35 hours? At what rate were lawns being mowed? 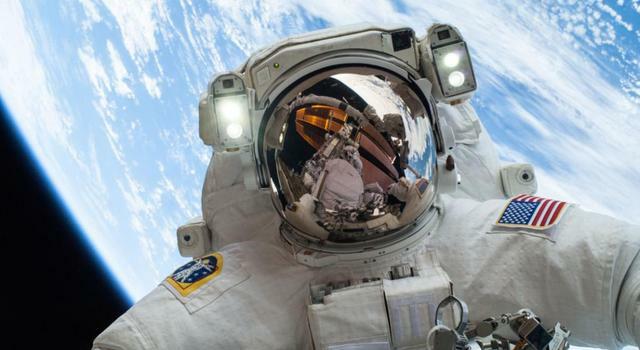 Based on the size of the silica grains (6 to 9 nanometers), scientists think they spend anywhere from several months to a few years (a longer time than that means the grains would be larger) traveling from hydrothermal vents to space, a distance of 40 to 50 km. What rate (in km/day) are the particles traveling if it takes them 6 months to travel 50 km (assume 182 days)? Do you think the particles in each example traveled at the same speed the entire time they moved? At what point in their journey might particles have been traveling at the highest rate? CCSS.MATH 6.RP.A.3.B - Solve unit rate problems including those involving unit pricing and constant speed. For example, if it took 7 hours to mow 4 lawns, then at that rate, how many lawns could be mowed in 35 hours? At what rate were lawns being mowed? CCSS.MATH 8.G.B.7 - Apply the Pythagorean Theorem to determine unknown side lengths in right triangles in real-world and mathematical problems in two and three dimensions. Cassini will be flying past Enceladus at a staggering 8.5 km per second (19,014 mph). At an altitude of 49 km, the plume is estimated to be approximately 130 km across. How long will Cassini have to capture particles and record data while within the plume? If Cassini is 49 km above the surface of Enceladus at the center of the plume, what is its altitude as it enters and exits the plume (the radius of Enceladus is 252.1 km)? This information can help scientists determine where in the plume heavy particles may fall out if they are not detected on the edge of the plume but are detected closer to the middle of the plume. It is also important because the Cosmic Dust Analyzer uses a high-rate detector that can count impacting particles at over 10,000 parts per second to tell us how much material is being sprayed out. CCSS.MATH 8.G.C.9 - Know the formulas for the volumes of cones, cylinders, and spheres and use them to solve real-world and mathematical problems. CCSS.MATH HSG.GMD.A.3 - Use volume formulas for cylinders, pyramids, cones, and spheres to solve problems. Gravity field measurements of Enceladus and the wobble in its orbital motion show a 10 km deep ocean beneath a layer of ice estimated to be between 30 km and 40 km thick. If the mean radius of Enceladus is 252.1 km, what is the minimum and maximum volume of water contained within its ocean? This is important because if scientists know how much water is in the ocean and how much vapor is escaping through the plume, they can make estimates about how long the plume has existed -- or could continue to exist.